Creekside Cabin - 3 Bedrooms, 1 Bath. Located in the Stratobowl, this classic Black Hills ranch style home was built in the 1950's along Spring Creek in the rugged canyon of the historic Stratobowl. It has been fully updated with all of today's modern conveniences including high speed internet and climate control. Located near Rockerville, this home is secluded, yet only 20 minutes from Rapid City or Mount Rushmore. Windows look out onto the best swimming hole in all of Sping Creek canyon. Surrounded by hiking trails along the creek and Forest Service, this is the perfect location for families searching for adventure in the great outdoors or couples who want to get away from it all in an incredibly peaceful setting. Sleeps 6. The master bedroom has a king size bed with large windows looking down to the creek. A second bedroom has a queen size bed also with views of the creek. The third bedroom is the heritage room with a king size bed built into the room. The home has a deck on the creek side where guests can enjoy their morning coffee or grill out later in the day. There is a well equipped kitchen and a very comfortable living room with a 42" television. The bathroom has a walk-in shower with grab bars. The single level and attached garage make it ideal for anyone with mobility difficulties. It is about 20 minutes to Rapid City and 20 minutes to Mount Rushmore. Enjoy the natural beauty of the Black Hills secluded in this classic home along Spring Creek. The home is located in a very unique and historic area, the Stratobowl - birthplace of the Space Age. Check in time is 4:00 PM and check out is 11:00 AM. About the owner: We live in the Black Hills of South Dakota in a place known as the Stratobowl. This geological wonder is carved from the combined effects of water erosion and the uplift of a fault line in the rugged Spring Creek canyon. Secluded and idyllic, the property is reminiscent of another era. Maybe it is the silence, the old limestone cliffs, or the song of the creek meandering through the seasons. As these ancient voices surround us, we breathe in all the natural beauty. Peace melts into our being and comes out as creative expressions. When the moon is full, the canyon becomes an illuminated, mystical experience. That is why, at one time, this place was named 'Moon Valley'. Then, in 1934 and 1935, the Army Air corps and National Geographic Society launched manned balloon flights into the stratosphere from here. It was then, that the family field acquired its new name of 'The Stratobowl' while becoming the birth place for the space age. This specific home was built by our grandparents, Lawrence and Betty Jacobson in 1950. It has recently been renovated. With great pleasure, we share this property with guests from around the world. This home is one level. It has an attached garage to protect your vehicle, and the swimming hole in the backyard is one of a kind. This is truly THE Black Hills experience. One bathroom with a shower. Property is surrounded by Forest Service and at the end of a dead-end road. The incredible 400 ft rock walls of Spring Creek Canyon are right out the window. The back deck looks out over the best swimming hole on Spring Creek. 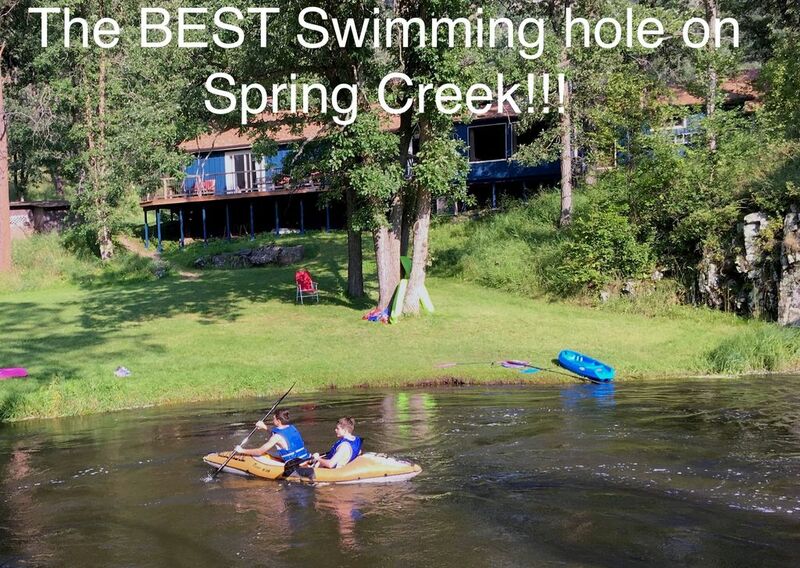 A large back lawn gently slopes down to the swimming hole on Spring Creek for great access. Cell Phone Service with AT &T and Verizon. Owner/Manager lives within 100 yards and has a land line available if necessary. Attached garage available to guests. Fully Equipped Kitchen with Dishwasher, Range, Refrigerator, Microwave, coffee maker, and Reverse Osmosis Water system. Dining table in kitchen area seats 6 with table expanded. Spacious Lawn between house and creek. The Black Hills are great for bicyclist and mountain bikers. Back deck overlooks the best swimming hole on Spring Creek. Inner tubes and floatation toys on hand for swimming hole. The home is one level with an attached garage. Everything you need in one sweet package. This cabin far exceeded our expectations. The home itself has anything you could possible need in it. The outside area was even better than we could have imagined. We spent 4 nights in the cabin with 2 boys ages 10 and 15. Both boys were completely entertained with the creek, swimming hole and hiking. The cabin is close enough to area activities, but also far enough away that you feel like you are in the middle of no where. We would highly recommend this vacation home and can't wait to go back someday. Thank you, Kim for the wonderful review. It means so much that you loved the space and the place. We hope you will return someday! Fantastic location. The view was incredible with trails and caves within walking distance. Kids had a blast in the river swimming, kayaking, and fishing. Ken and Cory were great hosts. I will stay here again. It's a little bit of Heaven! We thoroughly enjoyed our stay. We were contacted by Cory on the day of our arrival so that she could meet us when we got there. We were greeted by Cory and given a tour and history of the house and location. The setting is perfect, great location to Custer, Spearfish, Sturgis, Mount Rushmore, Reptile Gardens and much, much more. The games, toys and kayaks that were provided definitely added to our trip. The house has everything you will need. Full kitchen, WiFi, smart tv, but we didn’t really use any of it. You will want to be outside enjoying the breathtaking beauty. We are definitely recommend this place to our South Dakota bound friends. Wonderful place, close to shopping and all attractions. Grandchildren loved the swimming hole and kayaks. House was very comfortable and Ken and Cory were great hosts. Wished we could have spent more time on the river. We hated to leave. Loved the history of the house and the land. The home is located at the historic Stratobowl. It is within 15 minutes from Mount Rushmore and Reptile Gardens.